The Rogue Film School will be in the form of weekend seminars held by Werner Herzog in person at varying locations and at infrequent intervals. The number of participants will be limited to a maximum of 65. Locations and dates will be announced on this website and Werner Herzog's website: www.wernerherzog.com approximately 12 weeks in advance. 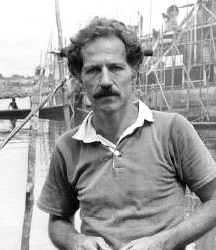 The focus of the seminars will be a dialogue with Werner Herzog, in which the participants will have their voice with their projects, their questions, their aspirations. Related, but more reflective, will be a reading list. Required reading: Virgil’s “Georgics”, Ernest Hemingway’s “The Short Happy Life of Francis Macomber”, and Baker's "The Peregrine" (New York Review Books Edition published by HarperCollins). Suggested reading: The Warren Commission Report, “The Poetic Edda”, translated by Lee M. Hollander (in particular The Prophecy of the Seeress), Bernal Diaz del Castillo “True History of the Conquest of New Spain”. Required film viewing list: The Treasure of the Sierra Madre (1948, dir. John Huston), Viva Zapata (1952, dir. Elia Kazan), The Battle of Algiers (1966, dir. Gillo Pontecorvo), the Apu trilogy (1955-1959, dir. Satyajit Ray), and, if available, “Where is the Friend’s Home?” (1987, dir. Abbas Kiarostami).